french macarons | what is clara eating today? whisk egg whites to firm peaks adding 1T(1.5g) of Splenda slowly. add flavor and color if you’re using them. pour into piping bag with a plain nozzle about 1cm in size. heat cream and Splenda in a small sauce pan (remove from heat before boiling) and pour over chocolate pieces and mix well. add butter and mix well. let it cool and thicken to thick syrup consistency (you can place it in the refrigerator for about 5 minutes to speed up the process, but don’t leave it too long. you don’t want it to harden). 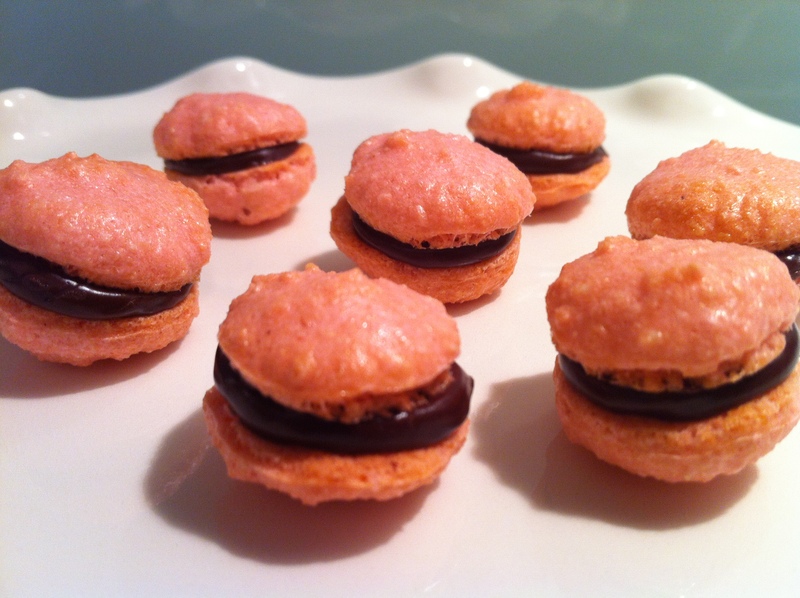 use about 1/2t of ganache for each macaron. Keep them in the refrigerator or freezer.